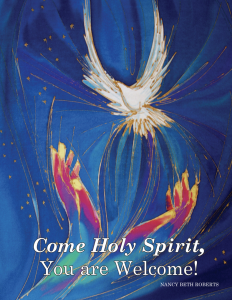 Come Holy Spirit, You Are Welcome! Come Holy Spirit, You Are Welcome!” was written to be a practical book about intercessory prayer. The book is an invitation to each believer to come deeper into a relationship with the living God. It motivates God’s people to know and communicate more intimately with the Father, through the Son, and the Holy Spirit. It also traces the history of the Harvest Prayer Network, including this website, from its beginnings in a small parish prayer group to a movement of the Holy Spirit throughout and beyond a diocese of the Episcopal Church. Testimonials – What Others Are Saying! As a member of Church of the Incarnation, Dallas; the Daughters of the King; the Order of St. Luke, and as a missionary to Mexico, Kenya, Ethiopia, and the inner city of Dallas (providing a “gang alternative” to inner-city youth), Nancy Beth Roberts has witnessed God’s faithfulness in answering prayer for many decades. Additional copies may be obtained from the Church of the Incarnation Bookstore at bookstore@incarnation.org or 214-522-2815.